Data is THE fundamental building block used in constructing Trade Intelligence. When I founded CenTradeX in the Spring of 2000, I endeavored to offer a missing value added component to readily available, inexpensive but obtuse trade statistics and reports. My initial premise was that there was tremendous inherent value locked away in publicly available trade data that had been hitherto ignored or undervalued. It was incredulous to me that NO one had ever layered global statistics with U.S. statistics. It seemed like a no brainer. First of all, I began the task of combining many sources of data together to provide a more complete picture, 3-D versus flat, such as U.S trade flows with global statistics with state exports. Thereafter, we integrated several sources of company data with statistics. Marrying huge sets of data organized under very different, asynchronous code systems is not a simple task. I and my team kept adding layer upon layer (of statistical, referential and company data) in order to develop this 3-D versus flat perspective of international trade. CenTradeX became the first to merge, integrate, marry, and correlate disparate data systems together. Our accumulated data repositories contain decades of statistical, company, and product information as well as the daily import waterborne manifests from U.S. customs and five years of transactional import & export data from China. World Statistics: Annual trade flow data (imports & exports) garnered from (up to) 192 countries, years 1996 through 2008. All commodities organized by HS code – by 2, 4 & 6 digit detail – as well as summary tables. U.S. Statistics: Annual trade flow data (imports & exports) also organized by HS code – by 2, 4, 6, & 10 digit detail along with summary tables; years 1989 to 2009. State Export Statistics: Annual trade flow data organized by HS code – by 2, 4, 6 digit detail along with summary tables; years 2000 to 2008. U.S. company information: A rather extensive database, accumulated and refined over a decade, that details U.S. companies engaged in some aspect of world trade; exporters and importers as well as ‘service’ related entities. Global trading companies: Gathered from many sources over 10 years highlighting importers & exporters as well as ‘service’ related entities. China company /statistic database: A huge, transactional database of Chinese trading companies – along with virtually EVERY import and export transaction (including the values of each shipment) from years 2000 through 2006. Translated and normalized into English. 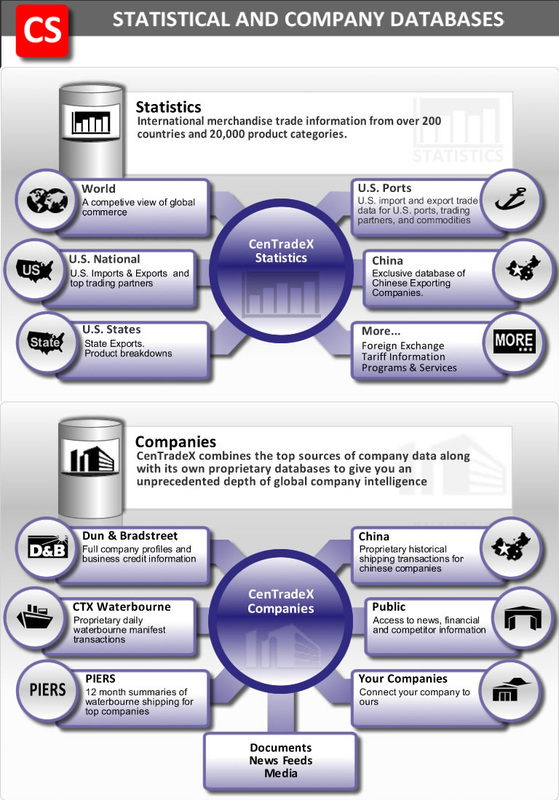 U.S. Customs waterborne manifest data: A mammoth, highly refined database collection detailing virtually every U.S. import (waterborne) shipment– on a DAILY basis – from January 1, 2006 though May 31, 2010 including millions of transactions per year with extensive detail on products, shippers (sellers), importers (buyers) and shipping data. Reference tables: Normalization and referential tables that serve to LINK the various databases referenced above as well as provide easy access to and /or understanding of obtuse data such as harmonized code language, trade nomenclature or obscure data fields.